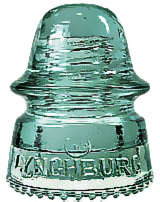 There are fourteen basic styles of glass insulators that carry the Lynchburg name, with at least one style made without the name (for other possibilities see Gayner Insulators at Lynchburg?, Birmingham, and Mysteries and Questions). 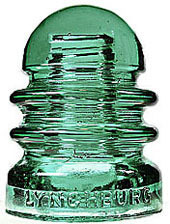 Collectors designate various insulator styles by Consolidated Design (CD) numbers using a system developed in the early 1950s by N. R. "Woody" Woodward, the pioneer in insulator research and collecting. The listings here are organized by style according to CD numbers. 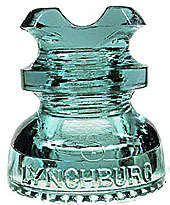 Lynchburg insulator styles occur in a wide variety of lettering, errors and corrections, colors, modifications and adaptations, and types of bases and drip points. All lettering on the molds is hand engraved, with the exception of a few mold numbers that are die stamped. 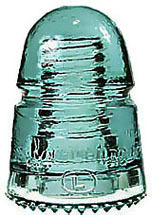 This means that no two molds are identical. 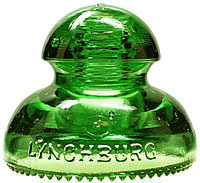 Lynchburg was generally consistent in numbering molds, which in most cases makes it relatively simple to track a single mold through various versions. 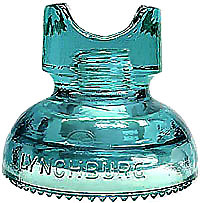 To assist in identifying these variations, I have assigned additional designations developed specifically for Lynchburg insulators to describe these variations (for varieties of bases, see Lynchburg Base Types). The following glossary of terms and labeling conventions will assist in using this web site. 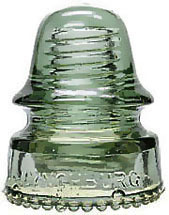 style - various shapes of insulators designed for different applications, classified by CD numbers. 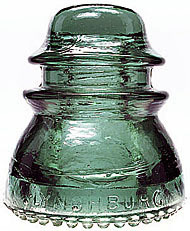 type - variations of a single style of insulator characterized by significant design differences, such as the shape and width of wire groove, listed by Roman numerals (I, II, etc). The types are defined in specific CD listings. The classification of types for some styles may be open to revision and correction in light of new information. variety - minor differences in a mold that does not warrant a different type, listed by lower case letters (a, b, etc.) following the mold number; these are not common (see example 3). retooled - a mold altered in some minor way, such as correcting lettering or thickening the skirt, without changing its basic appearance. reworked - a major alteration of a mold that changes its basic appearance, such as widening the wire groove; usually these are noted by different TYPE designations or (in one case) by different CD numbers. Molds without mold numbers are noted by a capital letter (Mold A). In a few cases, an unnumbered mold was later retooled and given a number (CD 145 II, Mold F). The later numbered mold will be listed normally with a notation that the mold is actually retooled (CD 145 II, Mold 6). 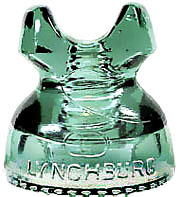 Molds used by Lynchburg and then retooled for various reasons (except the addition of a mold number) are indicated by a decimal number after the mold number (Mold 5.1). 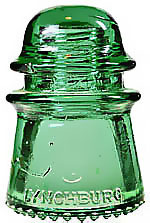 The letters G, B, or L preceding mold numbers refer to molds originally made by either Gayner (G), Brookfield (B), or Lynchburg (L), used primarily on styles that had duplicate mold numbers on different types, such as the CD 106 and CD 162 (Note: The letter G alone following a CD number and without a mold number refers to an unnumbered Mold G; see #1 above (CD 252, Mold G). 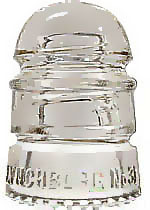 The type designation is written immediately before the mold number using Roman numerals (CD 145 II, 3 = Style CD 145, Type 2, Mold 3). The classification of types for some styles may be changed in light of new information. A lower case letter used after the mold number refers to different versions of the same mold with identifiable features that were not the result of retooling, for example a mold that was damaged while in use. 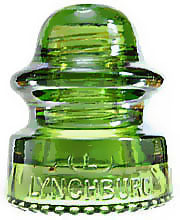 Example 1: CD 106 II, G1.2 refers to style CD 106, variation Type II, reworked Gayner Mold 1, in the second retooling of the original Lynchburg production. Example 2: CD 252, F refers to style CD 252, in unnumbered Mold F.
Example 3: CD 106 II, L9.1b refers to style CD 106, variation type II, the first retooling of Lynchburg mold 9, and the second variety of that retooled mold, in this case a mold that was damaged but still used causing consistent identifiable features on all subsequent pieces made from that mold. For a listing of Birmingham CD 106 mold numbers: Birmingham CD 106. Clicking on the picture loads a page with more detailed information on each style. 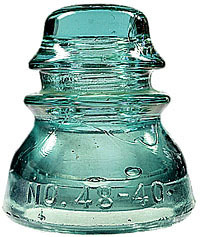 There is a wealth of information on insulators at the National Insulator Association site.